New Andrea PC Audio Software Bundle Provides Multi-function High Fidelity Audio Operation with Andrea USB Devices. *Note: Only compatible with Windows 7 and newer versions. New Andrea PC Audio Software provides the latest Audio Commander and noise cancellation filters for use with all Andrea USB Devices. This install supports Windows. 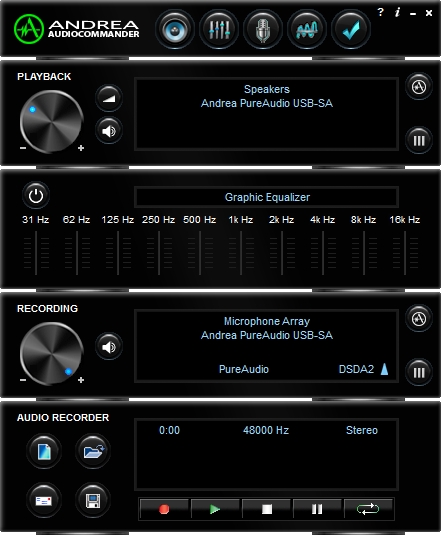 New improved AudioCommander audio user interface for Andrea USB devices provides the same great features customers have always enjoyed with a new look and feel. Now featuring full bandwidth VU meters for input and output, new PureAudio™ noise reduction filtering for hearing clean audio output as well as new DSDA3™ microphone array beam steering. Including, Side Tone for monitoring your recording and the ability to enable multiple filters independently. AudioCommander is SKYPE certified. Speaker output is enhanced with Andrea’s PureAudio™ noise reduction for removing noise from your VoIP received audio. By cleaning up the signal you are listening to, you increase intelligibility. Includes a high fidelity 10 band Graphic Equalizer with preset selections for the specific control of bass, mid-range and treble audio levels for customizing the sound tone to fit your music type. Microphone input has PureAudio™ noise reduction on left and right channels that removes repetitive and stationary noise from your microphone signals as well as electrical buzz from noisy power sources. EchoStop™ is a full duplex acoustic echo cancelation algorithm enabling both the speaker to broadcast and microphone to transmit simultaneously, turning your PC into a high quality speakerphone. EchoStop™ has PureAudio noise reduction built-in for minimizing annoying background noises to enhance your VoIP communication experience. DSDA2 is a directional beam forming noise reduction software that provides directional array microphone noise reduction. DSDA2 is designed to enable far-field (headset free) speech recognition command and control performance with our SuperBeam array microphone accessory. DSDA3™ is an adaptive beam forming noise reduction algorithm that provides extreme directional array microphone noise cancellation performance. Both DSDA2/3 have stationary or manual steering control of beam direction. Enhance VoIP communications and videoconferencing applications for clear conversations in noisy environments without the need for a close talking boom microphone. Beam Direction is a new beam steering feature that enables an accurate manual control to steer the microphone beam to point towards your desired reception direction. Microphone Boost provides microphone pre-amplification of up to +30dB of additional input gain to your microphone sensitivity, for picking up even the most faint sounds in your recording environment. Provides unfiltered true left and right stereo microphone audio input for high fidelity stereo recording.